Did Six Flags Flat Out Lie About Jokers Jinx Ride Control Systems? Do you smell that? Recently, Six Flags America released a statement regarding an incident with The Joker’s Jinx roller coaster that just felt… off. For those unaware of the harrowing evacuation, let me get you up to speed. On April 13, 2017 a train stopped on the track of The Jokers Jinx midway through its run. In roller coaster speak, the ride “valleyed,” or came to a stop, in a dip in the track due to lack of inertia. Now where things got hairy was this particular valley was 100 feet in the air and NOT next to any kind of ride evacuation platform. Thus, fire rescue teams were called in and the train had to be evacuated very slowly over a period of four hours. No one was injured and the ride was reopened two days later after inspectors gave it the green light. All is good, right? Kind of. “The safety of our guests is always our highest priority. In April the JOKER’S Jinx ride stopped before completing its normal cycle. The riders were not in any danger and no one was injured. “While it looked dangerous, and generated a lot of media interest, this ride stop was actually proof that our ride safety systems were working exactly as they should. All of our rides are engineered to stop safely. 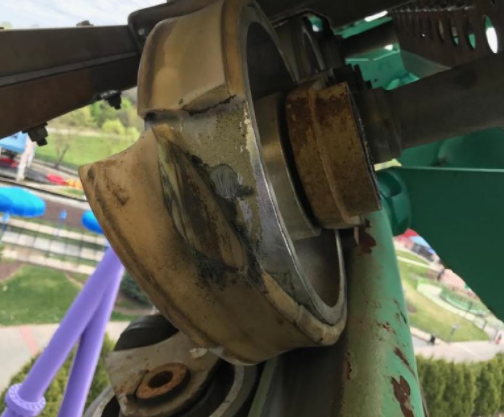 “After a thorough inspection of the ride, Six Flags corporate engineers and certified ride technicians identified an issue with one of the train’s wheels and took comprehensive action to resolve it. State of Maryland ride inspectors cleared the ride to be put back into service on Sunday, April 16. “Our rides have hundreds of sensors constantly measuring and watching every aspect of the ride, similar to the sensors in your car that flash an alert if you’ve forgotten to buckle your seat belt or left one of the car doors open. The difference is that while you can still drive your car with these alerts on, if a sensor on a ride sends an alert, the ride will automatically shut down in a safe location. The tire that caused the problem. Now if you don’t know how roller coasters and safety ride systems work, that official Six Flags released statement may sounds dandy. However, there are some major red flags here. Let’s take a moment and unpack a few points that make absolutely no sense. The Ride Stopped In A Safe Place…? Sure, The Joker’s Jinx train stopped in a position where riders were not upside down, but that hardly means it was safe. Do you think that roughly 60 feet off the ground in a spot with no evacuation platform where fire fighters have to come in and get people down one by one is safe? Granted, they did a great job and as stated before, no one was injured. However, do not let Six Flags fool you: this was far from a safe location to evacuate riders from any attraction. Ever. Now what came from the official report was that the coaster car had one of the polyurethane tires come apart on a wheel mid-ride. Just like tires on a car, these things happen. This is actually fairly common occurrence (just like on cars) on many theme park vehicles from roller coasters to dark rides. Can this be prevented by maintenance? Yes. However, when this does happen on a roller coaster, it slows the train down significantly and in this case….? Did The Ride Control System Stop The Train? Now every ride on planet Earth in modern times has a ride control system that monitors many many things. It signals the ride attendants on when it is safe to dispatch and ensures the coaster train is traveling at the speed that it should in various points along the track. If it doesn’t a shut down will occur even if the ride is seconds to fractions of a second off schedule (depending on programing of the particular ride at hand). The important question to be asked is: HOW? Since most roller coasters rely on gravity to return you to the station past the initial lift hill or launch (including The Joker’s Jinx), that means if the ride needs to stop for any reason, brakes are located in several spots along the track to ensure trains to collide into one another based on how they are designed to be spaced in normal operating conditions. And indeed, if The Joker’s Jinx was running two trains on this particular day the second one was never dispatched so in that sense the ride control did its job! However, let’s go back to that spot where riders were left dangling roughly 60 feet in the air. There were no brakes embedded in the track there. At all. Meaning the only way possible for the ride control system to send a signal (wirelessly) to the train would be for it to have it’s own braking system built in to the actual train itself. Premier rides built The Joker’s Jinx in 1999. 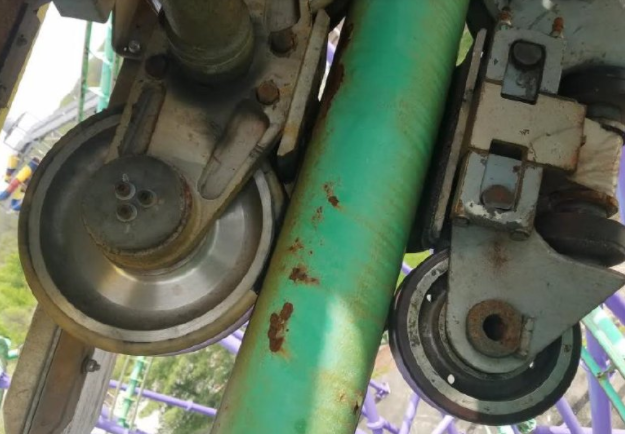 I do not proclaim to be a spokesperson for Premier (nor Six Flags), but an internal braking technology doesn’t look like it was ever used on this particular coaster. Let’s think about that for a second though. What if that technology existed? What would those brakes look like? Where does the power come from to engage those brakes? How does it send a signal at exactly the right moment? What if it gauges the forward motion of the train incorrectly and the ride stops (even partially) in an inversion? If Six Flags statement is correct, the internal breaking system on The Joker’s Jinx is unprecedented. However, the ride should have been built with an evacuation platform at least near that particular section, shouldn’t it? Assuming that’s one of the designated spaces the ride would stop, wouldn’t it be smart to not have to call fire fighters in to get people off that high in the air… twice? What if a ride system at any other Six Flags park also has a similar issue where a tire starts to come off of a roller coaster wheel. Except this time, it does grind the train to a stop either midway through a loop or smack in the middle of it. Yes, this has happened on roller coasters before (though it is rare). Now that rescue mission to get the riders down becomes far more precarious. Staying in a position where the blood is rushing to your head for prolonged periods of time can be dangerous and getting people down will take far more time. It would take much more work to secure a train from not budging if it has not valleyed. 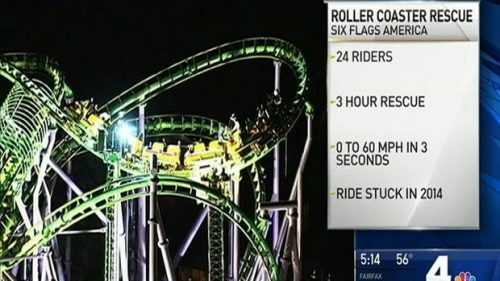 And again, IF that were to ever happen at a Six Flags park, what the riders, their families and the media should be asking Six Flags is the following: if the safety systems for The Joker’s Jinx to allow the proper and (arguably) easy rescue of riders there to get down, what happened in this new incident? Did they fail? Why would Six Flags allow a ride to do something like that, with the thousands of ride sensors that shouldn’t have put the train in a dangerous position to evacuate it? They will not be able to answer that question. And I’m not wishing it happens to anyone on any ride at any park. However incidents like this prove that they are indeed possible. More importantly, it could look like the people who design safety control systems for rides are not doing their job. Not the case. Even more importantly, it could hurt the entire industry. Generally speaking, the public looks at all roller coasters the same. Either you trust them or you don’t. And trust is huge in this industry. I personally have serious trust issues with how Six Flags handled the wording of their statement to the press in the The Joker’s Jinx incident. You should too. The question is: how do we let them know that they aren’t fooling anybody? Your thoughts? This entry was posted in Theme Parks 101 and tagged Jokers Jinx, roller coaster safety, roller coaster stop, Six Flags America, Six Flags Safety. Bookmark the permalink. Trackbacks are closed, but you can post a comment.